NASA?spowerful Mars Reconnaissance Orbiter has recovered from an odd glitch thatforced it to switch to a backup computer last week. Engineersat NASA?s Jet Propulsion Laboratory in Pasadena, Calif., successfully revivedthe orbiter from a protective safe mode and resumed science observationsof Mars on Monday, mission managers said. The4-year-old Mars Reconnaissance Orbiter is NASA?s youngest spacecraft circlingthe red planet and the most powerful to date. Since arriving at the red planetin 2006, the orbiter has beamed home more data and images than all other Marsmissions combined. Last week,the orbiter spontaneouslyswitched to its Side B backup computer for reasons still unknown to missionengineers. 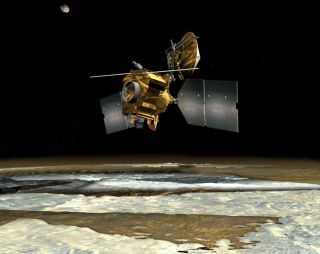 The computer swap occurred Thursday and sent the Mars ReconnaissanceOrbiter in to a safe mode for protection while it awaited new instructions fromEarth. Engineersreactivated the orbiter?s systems on Saturday and restarted its scienceinstruments two days later. The $720million Mars Reconnaissance Orbiter has entered safe mode seven times since it launched toward Marsin 2005. In two of those instances, one in 2007 and the other in 2008, thespacecraft switched to its backup computer, mission managers said. The orbiter?slatest glitch has some similarities to the two previous computer swaps, theyadded. Earlierthis year, the spacecraft entered safe mode on two occasions after unexpectedlyrebooting its main Side A computer, most likely due to a hit by a stray cosmicray or solar particle, mission managers have said. The new malfunction appearsto be unrelated to those events, they added. The MarsReconnaissance Orbiter completed its main mission in 2008 and is currently inthe middle of an extension phase that ends in mid-2010.